Man! It's been more than a year since my last post on here. Apparently I'm lacking the drive and commitment to keep this site updated frequently. I'm sorry. But after five years in the toy business, my focus has certainly changed. 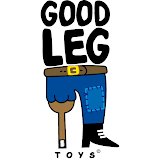 I'm more into making my own stuff over at Goodleg Toys, with my man Pablo Perra (and with Ralph Niese joining in from time to time). I also started a new resin bootleg project, called Underworld Muscle. I wrote a comic script that is currently being put into comic book form by comic artist Lukasz Kowalczuk. Then there's my Knock-Off Collectors blog, and the Facebook fan page and trading group that I'm doing with my KO-collecting buddy Steve Seeley. There's alot of stuff happening. But keeping a mediocre toy blog running isn't one of my priorities at the moment to be honest. Also, the whole Toy Sector thing has developed from a "day job" into a merely small side project of mine. I could update the store on a more regular basis, as well. But I'm really only doing it when I don't have anything better to do. Which isn't the case very often. Where is my drive? Anyhow, I'm feeling kinda responsible. Toy Sector is like the first child I gave birth to, and for some reason just moved a little out of sight. Other kids followed and took its place, and are keeping me busy day and night. Which doesn't mean that Toy Sector isn't still a piece of my heart. I put effort, energy, and passion into it. I can't just let it die.